Walden was traded to the Atlanta Braves this past offseason. This will be my 8th season (2005-present) working as the stadium operations guy here with the Cedar Rapids Kernels. I will be reminiscing the best performances by the Kernels during my tenure to add to my This Date in Kernels Alumni History features this year. Its not quite the best in Kernels history as the team became the Kernels in 1993 as we started our affiliation with the Los Angeles Angels of Anaheim, but it is a start and research is never truly complete anyway. 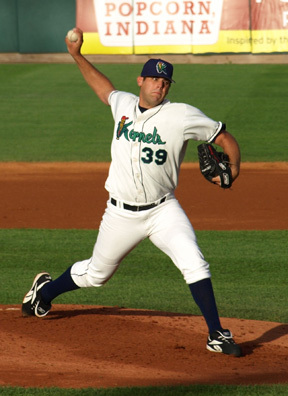 On April 5, 2008, Jordan Walden pitched a complete game taking the loss as the Kernels fell 1-0 to the Clinton Lumberkings. Walden struck out four while allowing one run, six hits and a pair of walks in his Kernels debut. On April 4, 2008, Tyler Johnson was 2-4 at the plate with a HR, two RBI and scored a pair of runs as the Kernels defeated the Clinton Lumberkings 10-6.